Price has moved lower as expected. A clear breach of the channel on the hourly chart confirms a third wave down should have begun. Summary: A third wave down has most likely begun. The target for it to end is 1,247 and this may be reached in four more days, or more likely seven more days. This analysis is published about 05:35 p.m. EST. Click on charts to enlarge. 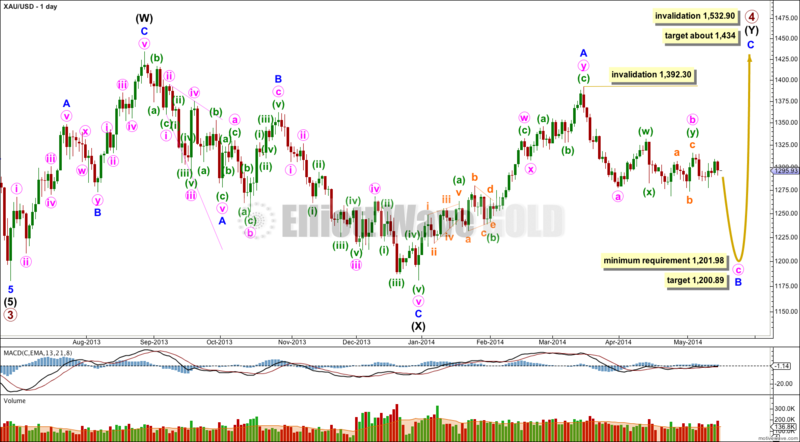 Gold is still within a large fourth wave correction at primary wave degree which is incomplete. Primary wave 2 was a rare running flat. Primary wave 4 is unlikely to be a flat correction because it is likely to show structural alternation with primary wave 2. Primary wave 4 is most likely to be completing as a double combination: zigzag – X – second structure. The second structure labeled intermediate wave (Y) is most likely to be a flat correction. Within the flat correction minor wave B must reach a minimum 90% the length of minor wave A at 1,201.98. If downwards movement does not reach 1,201.98 or below then intermediate wave (Y) may not be a flat correction and may be a contracting triangle. I will keep this alternate possibility in mind as this next wave down unfolds. If it looks like a triangle may be forming I will again chart that possibility for you. Overall the structure for primary wave 4 should take up time and move price sideways, and the second structure should end about the same level as the first at 1,434. Primary wave 4 may not move into primary wave 1 price territory. This wave count is invalidated with movement above 1,532.90. Within intermediate wave (Y) minor wave B downwards is an incomplete corrective structure, and at this stage the structure may be either a single zigzag (as labeled here) or a double zigzag (relabel A-B-C to W-X-Y). While this next wave unfolds I will have to consider two structural possibilities: it may be an impulse for a C wave, or it may be a zigzag for a Y wave. If minor wave B is a single zigzag then within it minute wave b may not move beyond the start of minute wave a above 1,392.30. Minute wave c would reach equality in length with minute wave a at 1,200.89. If minor wave B is a double zigzag, relabeled minute w-x-y, then within it there is no invalidation point for minute wave x. But X waves within double zigzags are usually relatively brief and shallow, as they very rarely make new price extremes beyond the start of the first zigzag in the double. The channel which was drawn about minuette wave (ii) on yesterday’s chart is now clearly breached with strong downwards movement. This provides trend channel confirmation that the upwards correction is over and the next wave should have begun. The next wave should be a strong third wave down. At 1,247 minuette wave (iii) would reach 1.618 the length of minuette wave (i). When there is more structure within minuette wave (iii) to analyse then I will add to the target calculation at a second and eventually third wave degree. This target may widen to a small zone or it may change. If it changes I would expect it to be lower. I have drawn a base channel about minuette waves (i) and (ii). Minuette wave (iii) downwards should be strong enough to break through support at the lower edge of this channel. Once the lower edge of the channel is breached then it should provide resistance. On the way down, and particularly before the lower edge of this channel is breached, the upper edge should provide resistance to upwards corrections. So far within minuette wave (iii) there is a lot of overlapping. This suggests a series of first and second waves has begun, which is typical when a third wave extends (which is most common). So far this has a typical look. I would expect downwards momentum to begin to increase over the next 24 hours. Minuette wave (i) lasted a Fibonacci five days. I would expect minuette wave (iii) to last a minimum of five days, and more likely a total Fibonacci eight days. This means the target at 1,247 may be reached in another seven days trading. Within minuette wave (iii) no second wave correction may move beyond the start of its first wave above 1,309.14. Yes, that’s entirely possible. And I’ve charted it before. If 1,201.98 is not met then this would be my wave count. At this stage I’m going with a combination because they’re actually much more common than triangles. On the daily chart, within wave B minuette, wave b could also be a contracting triangle – time consuming and converging – that appears to be over. 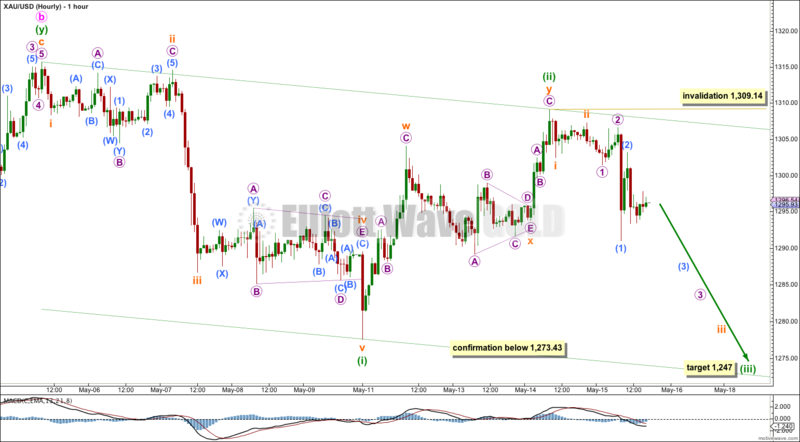 That count would not invalidated the double zigzag scenario having a b wave being a triangle. I’m looking at the subdivisions for that idea. I agree, on the daily chart it looks very strongly like a triangle. If I can satisfy myself that the subdivisions look right and work, then I’ll publish what I find tomorrow. It makes no difference to the expected direction, but it will make a difference to target calculation.